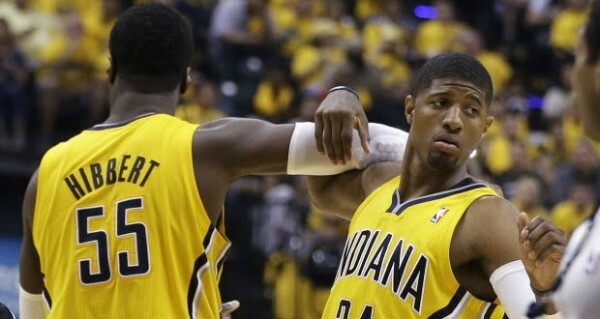 Things couldn’t have gone any better for the Indiana Pacers in game 1 of the Eastern Conference finals, beating the Miami Heat 107-96 to take the 1-0 lead with Paul George, Roy Hibbert and David West leading the way, while the Miami Heat didn’t get anyone to show besides LeBron James and Dwyane Wade. This was Pacers basketball, especially when facing the Heat, at its best. Pushing the ball early to Roy Hibbert and David West, having no trouble at all dominating anyone (Chris Bosh, Udonis Haslem, LeBron James) defending them in the paint to build an early lead the Heat were never really able to close down. Early on it looked like a matter of time before Miami would break loose, but they never did, and the Pacers were able to keep a double digit distance for most of the time. The Heat’s defense folded inside to help on Hibbert and West, which left shooters completely open. The Pacers moved the ball quickly after getting stops, and that was the key to their best offensive performance in these playoffs and against the Heat over the last two seasons. They made 8-of-19 from beyond the arc compared an awful 6-of-23 from the Miami Heat, which easily explains the difference. The Pacers shot 51.5% from the field, just like the Heat, but were able to get to the line (37 attempts) while the Heat shot only 15 free throws. It had something to do with homecourt officiating, but nothing too drastic. The Heat couldn’t get in the paint, as the Pacers outscored Miami by 19 points when Hibbert was on the floor, which also made them shoot from 7 feet further away than without him on the floor on average. Hibbert didn’t score with ease, but did finish with 19 points and 9 rebounds, doing a good job from the line with 9-of-13. David West was just as much trouble for Miami with 19 points, making things a lot easier for George, Hill and Stephenson. A confident George Hill is another one of those X-factors for the Pacers. He started hot with a corner three and aggressive drives to the basket, scoring 15 points on 3-of-7 from beyond the arc. Paul George led the team with 24 points and 7 assists, knocking down 3 tres of his own. Lance Stephenson didn’t exactly blow Wade’s knees up, but he moved the ball well, scored 17 points and added 8 assists, while C.J. Watson added surprising contribution from the bench with 11 points. You look at Miami and you see the same team from last year (showing how badly their signings worked out), only a bit weaker. Chris Bosh was left open but couldn’t make anything happen, and remembered attacking the basket only in garbage time. LeBron James had 25 points but sometimes it felt like he isn’t doing enough to make his team find easier shots. Dwyane Wade mixed good shots with bad, but he did finish with 27 points. The Heat are at their best when role players show up: They can win with James scoring 40 points each night, but the better basketball is when Mario Chalmers, Shane Battier and Ray Allen stretch the floor. That didn’t happen, as Miami let the game slip away from them early on before being forced to play catch up all night long. The Pacers can win with just their starting five doing everything, which was quite close to the scenario in the win. Maybe home court will prove to be the difference once again, but this win was about more than fans. 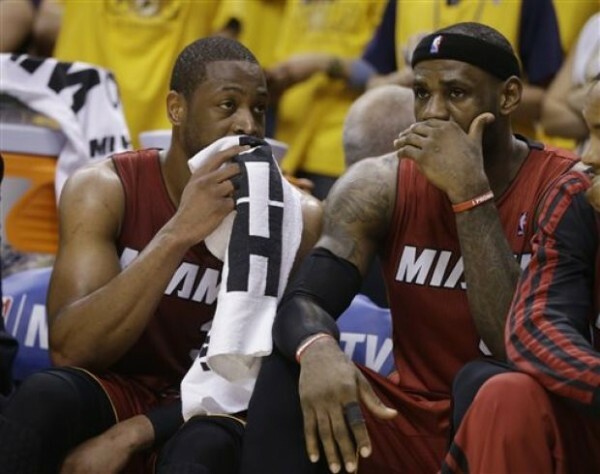 It had to do with the Pacers executing their defensive and offensive plan perfectly, while the Heat slightly panicked on offense and took too many bad shots and made too many bad decisions, not getting creative when it was time to. Indiana seem like the team from earlier this season, and the Heat will have to step up their game, aside from the adjustments they’ll be forced to make.